Carta del marinero norteamericano, Erwin Alden Morse, abordo el USS New York, relatando el bombardeo de San Juan del 12 Mayo 1898. 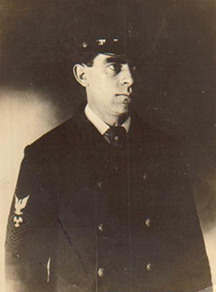 ".....My grandfather Erwin Alden Morse was a yeoman on the New York and kept accurate accounts of a number of naval battles including the taking of Guantanamo Bay by the U.S. My grandfather's letters tell of the help that the Cuban people gave to the American Navy during the war against Spain. The letter (in the web page) was one of 26 that my grandfather wrote to his sister, my aunt Lillian Jane Morse (They were residents of Massachusetts). She saved them and they are excellent chronicles of that period in the Spanish-American War. I now have them. Erwin Alden Morse was a descendant of John Alden, one of the first settlers to arrive on the Mayflower from England and was very patriotic, but even he was saddened by the terrible toll that war took on both the Spanish and the Americans. We can only pray that someday there will be peace between the peoples of the earth so that no one will ever have to go to war again. Thank you again for your cooperation in setting the record straight. We arrived off this port during the midwatch 12­4 the night before last and all hands were called at 3 a.m. yesterday morning, (May 12). There were the following ships in the fleet; New York, Indiana, Iowa, Detroit, Montgomery, Amphitrite, Terror and the tug Wompatuck and torpedo boat Porter and supply ship Niagara. The Niagara and Wompatuck lay off in the distance. At 4:30 the ships headed into the harbor headed by the Detroit. Not a shot was fired on either side until the Detroit was abreast the water battery of Morillo(1), when two shots were fired from the water battery(2). The Detroit immediately opened fire and at 5:26 a.m. the fleet bombardment was something terrible. 1- Se refiere al Fortín del Cañuelo. 2- Es un error del marino Alden ya que el Fortín del Cañuelo estaba desocupado para ese tiempo y además los primeros disparos fueron hechos por la flota americana. The forts replied in good shape and more guns were mounted there than we expected. Shells from ships set the town on fire in several places and destroyed many buildings. We steamed in a circle past the forts and kept going around with a starboard helm. The shells from the forts fell all around us and only one struck us. It was a 10" shell and struck our forth cutter and burst killing one man(3) and wounding four others. After another round at the forts we withdrew after having been in action 3 hours and 10 minutes. The water battery was silenced and undoubtedly there are many widows in San Juan today. At 5 p.m., the dead body was brought aft and laid out on the quarterdeck covered with the American flag. All hands marched aft and the flag was half masted and the chaplain read the burial service and the body was taken to the side, escorted by a sergeants guard of Marines and followed by the 2nd Division to which the deceased belonged. The band played the Dead March and then the chaplain said a prayer and the remains were committed to the deep. The band then played "Nearer My God To Thee" and the guard fired three volleys over the grave. The death of our shipmate cast a gloom over the ships company forward and aft. The injured are all on the road to recovery. 3- Según los datos que tenemos sólo hubo dos muertos en el lado americano: uno en el USS New York y otro en el USS Amphitrite, ambos de la clase marinera. También hubo varios heridos en el USS Iowa. I tell you, a person feels rather queer when he hears the shells whistle by and doesn't know the moment he will be struck down. War is a terrible thing. At least one hundred shells passed over our ship and struck the water near us. The Spanish had very poor marksmen for their shells were all too high(4), with one or two exceptions. Several struck the Iowa but only three men were slightly injured. We evidently fared the worst. We are at present off Cape Macia awaiting orders. I am still uninjured and in good health. How is everyone at home? What is the latest news? Send me some papers. 4- La contraparte española tuvo la misma opinión de los artilleros americanos quienes, según los primeros, "dispararon mucho y dispararon mal". 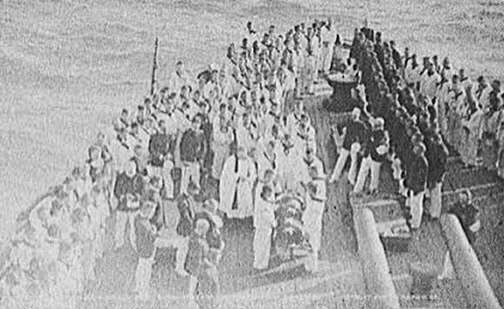 Funeral en el mar de un marino del USS New York, muerto durante el bombardeo a San Juan, y al cual Erwin Alden Morse se refiere en su carta.